Koi keeping often develops into an obsession for the pond and fish owner. Most people name their fish and consider them honorary members of the family. To create a healthy, stable environment for finned friends, a clear perspective of koi and their proper care is vital. The earliest written records of koi, dating back 2,5000 years, were found in Eastern Asia and China. Color mutations in koi, or “fancy carp” as they’re known by some, only appeared a few hundred years ago. And the hobby of koi-keeping didn’t emerge until the 20th century. With rampant development and industrialization, news of the koi’s beauty began to spread into the UK and North America. Although Japan is the “koi-producing capital of the world,” some of the nicest koi are found in backyard water gardens of North American homeowners. 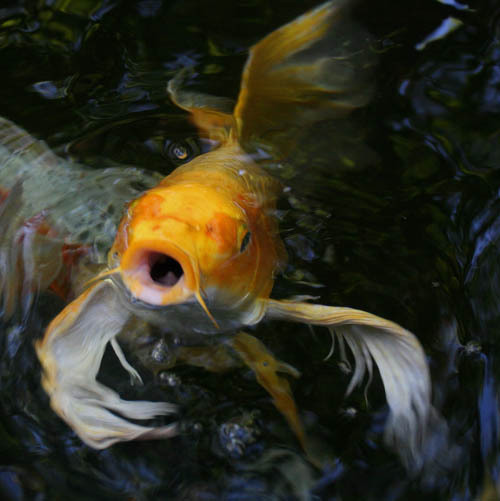 Overfeeding is the most common mistake that fish owners make when keeping koi. Like some humans, koi will accept more food than they can comfortably eat, which is harmful to both the fish and the ecosystem in which they live. Overfeeding leads to an increase in waste volume excreted by the koi, which in turn creates water that’s high in ammonia and nitrites – perfect for algae growth! Feeding koi should be avoided altogether when temperatures drop below 50 degrees Fahrenheit. In the presence of these relatively low temperatures, the koi’s metabolism slows to a minimum, reducing the fish’s ability to sufficiently digest or process what they consume. Feeding your koi less food is a wiser option. Only feed your koi what they can eat in a matter of minutes, once or twice a day at most. Overfeeding fish can lead to algae buildup since the excess food contributes to the nutritional load, and therefore algae growth, which in turn leads to more fish waste. Soon you have an unbalanced pond. Koi owners can actually abandon feeding altogether and still have very healthy fish. Some of your customers may be fearful of keeping koi in their pond, due to a few myths that are floating around. Here are some of the most common objections we hear, and the truth about these common fears. Myth: Fish create more pond maintenance. Truth: Fish are a crucial part of the pond ecosystem. Koi reduce algae by feeding on it, and they fertilize plants with their waste. In actuality, fish help to lessen pond maintenance. Myth: Koi cannot live in a pond with rocks and gravel. Truth: Koi, or carp, are river fish where rocks and gravel cover almost everything. Aquascape ponds, which house perfectly happy and healthy koi, are always lined with rock and gravel. Myth: I’ll lose all my fish to predators. Truth: If constructed properly, the risk of predators can be eliminated. Installing fish caves in ponds provide areas of safety for fish. Pond plants also create cover and places of refuge for your koi. Myth: Koi need at least three feet of water to survive. Truth: Aquascape recommends installing ponds that are two feet deep in the center. This depth allows the fish to survive through the winter months. Myth: I don’t want the trouble of bringing fish inside for the winter. Truth: Koi are extremely hardy fish, whose ancestors over-wintered in freezing conditions, and still do. Keep the water circulating and maintain a hole in the ice and they should be fine. Myth: I don’t want to spend thousands of dollars on koi. Truth: Pet quality koi start as low as $5 each, with show quality koi going for hundreds of dollars or more. Since fish food is relatively inexpensive, how much you want to spend on koi is up to your customer.